Yearlings repurchases from the recent Lazy E Ranch consignments from the Ruidoso Select Yearling Sale are available for purchase. GUTHRIE, OK—SEPTEMBER 4, 2018—Several outstanding yearlings from the Lazy E Ranch consignments to the just concluded Ruidoso Select Yearling Sale are still available for purchase. The repurchases include yearlings by sires such as Corona Cartel, Tempting Dash, Kiss My Hocks, One Dashing Eagle, One Valiant Hero, Pyc Paint Your Wagon and Favorite Cartel, out of great black type families. 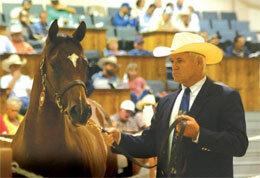 CLICK HERE to see pedigrees and photos of available yearlings posted on the Lazy E Ranch website. Contact Butch Wise at 405-640-2234 or Matt Witman at 405-613-0047 for more information.